MONROVIA, Liberia -- Presidents of West African countries ravaged by Ebola pleaded for aid at the World Bank on Thursday as the U.S. military ramped up its efforts in Liberia, the hardest-hit country. 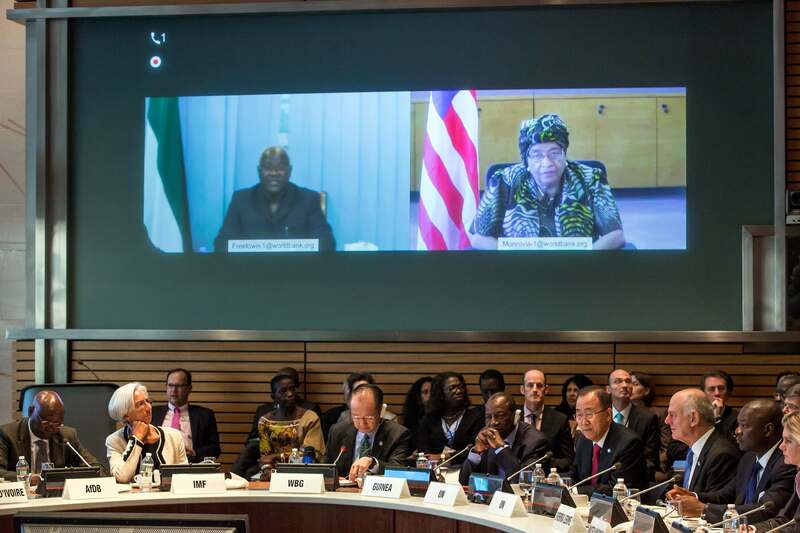 "Our people are dying," Sierra Leone President Ernest Bai Koroma said by videoconference at a World Bank meeting in Washington on the Ebola response. He called the epidemic "a tragedy unforeseen in modern times," saying the world is not responding fast enough as children are orphaned and doctors and nurses continue to die. A Uganda-born doctor, John Taban Dada, died early Thursday of Ebola at a treatment center on the outskirts of Monrovia, Liberia's capital. Liberian Health Minister Tolbert Nyenswah said the gynecologist and surgeon will be immediately buried Thursday in accordance with policy requiring quick interment of victims. His death brings to four the number of doctors who have died in Liberia since the outbreak. Over ninety health workers, including nurses and physician assistants, have also died. Two U.S. military flights were due to arrive in Liberia on Thursday, Army Capt. R. Carter Langston told The Associated Press in an email. "Two different flights of MV-22 Osprey and KC-130 aircraft, along with U.S. Marines, will arrive to support the whole-of-government effort to contain Ebola," Carter said, noting they would land at Roberts Airfield outside Monrovia. The U.S. government has committed a large number of military and humanitarian resources to help combat the disease's spread in West Africa itself. CBS News correspondent Manuel Bojorquez reports air travel and Ebola have become a major concern for the U.S. government, which will be spending an untold sum to fastrack changes to improve airport screenings for the virus. The Coast Guard has also announced new, additional protocols for screening for the disease. Critics say Liberian President Ellen Johnson Sirleaf's handling of the crisis has been heavy-handed and ineffective. Police used batons and rattan whips to disperse 100 protesters Thursday outside the National Assembly, where lawmakers were debating granting her even more powers beyond those contained in a state of emergency declared in August. Liberia's state radio announced that Senate elections scheduled for next week would be postponed. No new date was given. The U.S. military is working to build medical centers in Liberia and may send up to 4,000 soldiers to help with the Ebola crisis. Medical workers and beds for Ebola patients are sorely lacking, particularly in Sierra Leone and Liberia. Liberia and Sierra Leone only have enough beds to meet about 21 percent and 26 percent of their needs, WHO said Wednesday. British Defense Secretary Michael Fallon said his country would provide more than 750 troops to help build treatment centers and an Ebola "training academy" in Sierra Leone. Army medics and helicopters will also provide direct support. Britain will also provide an aviation support ship. British troops are expected to arrive in Sierra Leone next week where they will join military engineers and planners who have been there for nearly a month helping to construct medical centers. The German military has started flying material such as protective clothing from Senegal to the worst-hit countries. A German military advance team is heading to Monrovia on Friday to prepare the way for a wider aid deployment expected to start in mid-November. The military is expected to set up a clinic for 50 patients in Monrovia. Meanwhile, Sierra Leone officials finally released a shipping container filled with medical gear and mattresses that had been held up at the port for more than a month. Ibrahim Bangura, an official who handles medical supplies, said the container's contents were finally in his possession on Thursday. Bureaucracy and political infighting were blamed for delay in distributing the aid. Dada, the naturalized Liberian doctor who died on Thursday, served as the medical director of the Redemption Hospital in Monrovia from 2008 to 2013 before moving on to take up a new assignment at the country's largest hospital, the John F. Kennedy Memorial Medical Center, according to authorities at the Redemption Hospital. Dr. Atai Omoruto, a Ugandan doctor heading the newest Ebola treatment center at what used to be Island Clinic in the western suburbs of the city, expressed shock at the death of Dada, describing him as a very quiet and dedicated man. "I didn't know he has passed on; it is really unfortunate that we're still losing so many health workers," she told AP. "This Ebola really ... it has come for the health workers," she said, "Because right now at Island Clinic we have almost 10 health workers admitted including doctors from JFK and laboratory technicians and nurses." There was continued concern of Ebola spreading in Spain, where the first person known to have caught the disease outside the outbreak zone in West Africa became sick. The woman's brother, Jose Ramon Romero, told reporters outside the hospital that his sister Teresa had been intubated because of "something to do with the lungs." Intubation involves inserting a plastic tube into a patient's windpipe. The procedure is usually done to help patients breathe better either with or without a respirator or to administer drugs. But several hours after Romero spoke, a hospital spokeswoman denied that Teresa Romero had been intubated and said she was breathing on her own. Three doctors have been admitted to the Madrid hospital for precautionary observation, bringing to seven the number being monitored at the center, health officials said Thursday. In Germany, a man infected in Liberia arrived Thursday at a hospital in Germany for treatment - the third Ebola patient to be flown to the country. The first person to be diagnosed with Ebola in the United States, Thomas Eric Duncan, died Wednesday in Dallas. Five major U.S. airports plan to try to catch any travelers from Ebola-ravaged countries who may be carrying the disease by checking their temperatures on arrival. As public concern about the virus grows, many people are seeking more details about how Ebola is spread and how long the virus typically lives in a person's body and in the environment. "It's in there while the person has the infection," explains CBS News chief medical correspondent Dr. Jon LaPook. "Then your immune system comes in and it's either going to kill you or you're going to recover. And if you're going to recover, that virus is eventually going to leave your body. It leaves the blood more quickly than it leaves other areas."